The Austin College IDEA Center is a multi-disciplinary building of approximately 103,000 square feet includes contemporary classrooms and multi-purpose laboratories that support today’s hands-on, experiential science curricula. Offering considerably more space than the previous campus science facility, the IDEA Center expands opportunities for faculty-student research and facilitates access to research and information. 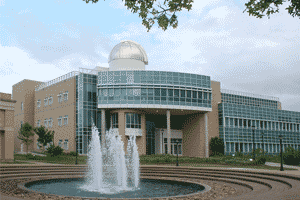 The building features 32 laboratory classrooms, 40 offices, 16 lecture rooms, a 108-seat auditorium, and a domed observatory housing a 24-inch telescope with an astronomical high-resolution image camera. Native landscaping and a decorative pond offer environmental education opportunities as well as aesthetic features. The center houses the departments of biology, chemistry, computer science, environmental studies, mathematics, and physics.